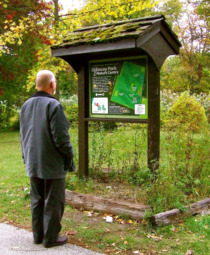 The signs were produced by graphic artist Scott Hughes, whose portfolio includes more than 100 interpretative signs for the Essex Region Conservation Authority’s conservation sites. He also designed the original templates for signs along the Chrysler Canada Greenway. His work can also be seen on interpretative signs at Point Pelee and along Windsor’s riverfront. “I’ve had so many people come into the nature centre raving about them,” Cedar said.